Help your kids get a positive start in the morning. When kids wake up listening to something fun and special they set themselves up to have a great day. Created by mother of four, Jennifer Jimenez, and longtime Broadway star, Robin Boudreau Palmer. 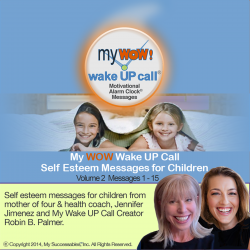 My WOW Wake UP Call Messages™ will awaken children with positive messages. Help your children get into the right state of mind to start the day positively. Now your children can start every day positively!